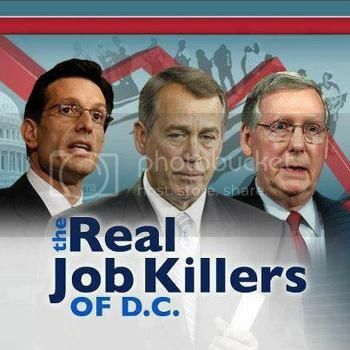 The Republican Party is pissed that there was 96,000 more private sector jobs created in August of 2012. They will tell you that this number is not good enough to rebuild America and blame the President for the sluggish economic recovery while they have been doing everything in their power to derail the President's jobs plan to make President a one-term President. Today they continue to blame President Obama for their lack of having done anything in the last 4 years to help spur the economy so that more Americans can go to work. The GOP HAS DONE NOTHING except SABOTAGE job growth to see more American out of work so that they can take the President's job. That is the plain and simple truth! Below the fold is a detail explanation of how they have sabotaged the President's many jobs initiative but even with all the resistance he has encountered from the GOP, 4.5 million private sector jobs have been created in the last 30 months, 512,000 Manufacturing jobs have been created since 2010 and over 1 million jobs have been saved because of the President Auto rescue plan. How could Americans forgive a Republican Party that is so interested in seeing Americans suffer for their political gain? Spread the word and let American bring in the verdict come election day. Romney/Ryan are not the answer for America because they will continue bleeding Americans until the few enslave all of us.